The second half of October was a sprint to use my new sewing inspiration and renewed desire to finish projects and managed to start and complete my Monster Mash quilt. November seems to be the month for little but important projects: swaps, a bee beginning and, if I can manage it, an entry to the QuiltCon quilt show. The teaser for that is to show you only this fabric. Now let's talk about the bee. I joined my first bee ever, hosted by Melissa over at Tension Issues, there are 12 of us and it is a star bee. We provided our colors and the bee members choose the star patterns and even the size of the stars. I can tell you I'm so freaking excited to participate in this! This was the star I made for the first months' recipient but I can't send it. I know I'm being hyper-critical, but it's a little crooked and there is just one corner point that will be lost when it's sewn into the top. However, I do like it enough to keep it so that may be part of the reason I can't let it go. Can't you just see a rainbow quilt with stars of different colors like this? I'm also in two swaps that need to be sent out in the next week. The first is a secret Santa swap hosted by Kara at Me and Elna. The deal was, make and send something crafty, anything, of an approximate dollar value. I struggled a lot with this one because the person I am partnered with did not have a lot of an online presence that I could discreetly stalk. Of all the areas I'm most critical and require the most of myself, it's to find the "just right" personal gift. Anyway, I tried making place mats. Fun on one side and maybe more practical and neutral on the other. 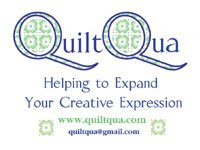 I designed, cut and sewed without a quilting plan in mind. I was reminded about how important that is. I thought to just quilt 3 SID lines using the fun side as a guide but I did not like the look on the opposite diagonal side because I had a neutral cream cutting through the black stripe. So I tried SID on the stripe side but the reality is, I just stink at quilting on my domestic machine. Too many crinkles on the fun side. I decided enough was enough. I took one of the new panels, added a border and made it an apron. I then decided to add a few other aprons to the mix for fun. Less detailed but reversible and yummy. It just seemed like I needed to do something else and with my new found bag making skills from the Sewing Summit, I set about making a bag. I bugged the Instagram folks to help me confirm fabric choices for the bag and then I was off. I found the pattern for Pick a Pocket Purse on All People Quilt, designed by Happy Zombie, but I do believe it's been in a magazine or two, as well. Let me tell you, it came together so easily and so quickly! If you are looking for a good and quick project, this is it. It would be a fantastic teacher gift with it's pockets and nice open main pocket. Those are my finishes so far. I'll update you with the new bee block and my sewing summit swap item as soon as they are done. Oh yes, and the mini-quilt. I'm determined to get it done.